Windsor Interfaces is no longer updating, maintaining or supporting any of the products listed here. The site will be kept up, and you are free to download and use the software as is, but we can not offer any further help. NoteLens is a note-taking tool that is so fast, it lets you concentrate on your notes - not on the interface. NoteLens is designed to help you stay in the flow. You never spend time deciding where to store notes, save them, or even give them names. NoteLens takes care of that for you. With a lightning fast full text indexing system, you can quickly find any note just by typing any word - all of the notes containing that word will be pulled up as you type. 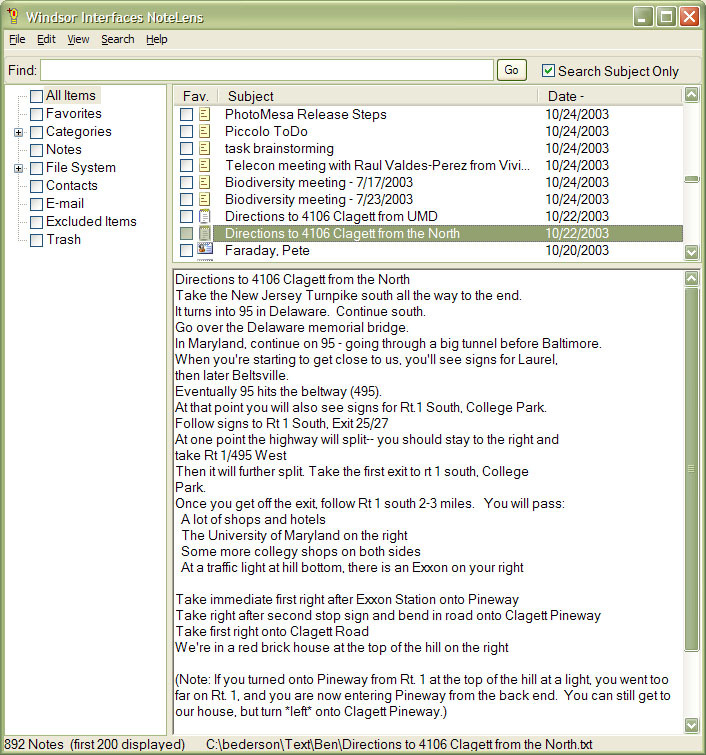 NoteLens integrates with Microsoft Outlook. You can import notes from Outlook, and then keep NoteLens and Outlook synced. (Although you don't need Outlook to take advantage of NoteLens.) With Microsoft ActiveSync, your notes will be synced with your Microsoft Pocket PC. NoteLens even syncs contacts and email, so you can have integrated super fast access to all of your critical information. 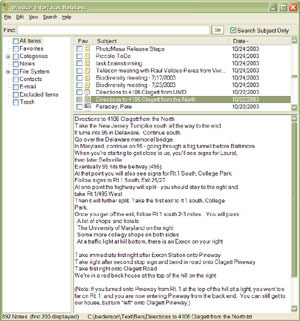 And you can rely on NoteLens with confidence, knowing that they are backed up in Outlook - and also stored in a simple text format so you'll never be locked in. We have found that NoteLens quickly becomes an integral part of users' lives - always running on the desktop, and just a keystroke away from jotting an idea down, or pulling up yesterday's thoughts. Read the News about NoteLens. NoteLens is designed to help you stay in the flow. Read the research that led to NoteLens. Want note-taking on the Macintosh?